Carl Perkins celebrates his induction into Hollywood, Calif.'s RockWalk in June. Tom Petty introduced Perkins at the ceremony, which was attended by Brian Setzer, producer Pete Anderson, and members of Dash Rip Rock. At the induction, Perkins was presented with the first prototype of a new Gibson Blueshawk guitar, and a donation was made to the Carl Perkins Child Abuse Center. 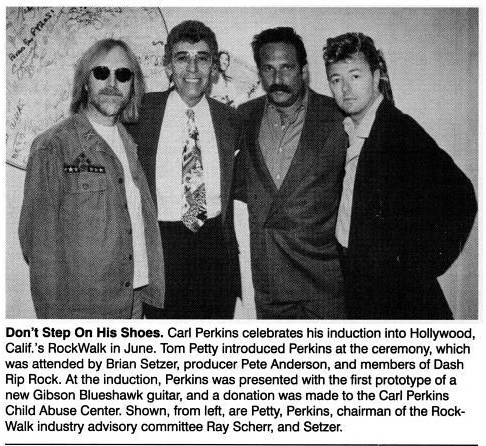 Shown, from left, are Petty, Perkins, chairman of the RockWalk industry advisory committee Ray Scherr, and Setzer.